Take my advice. I don’t use it. Go use your gift cards, gift certificates and Groupons. Or whatever other deals, steals and “free” money you’re sitting on. The answer: you should have made hay while the sun shined and before the Tax Man came-eth. Unless that restaurant gift-card belongs to a joint with a sibling still in business, and the owner of that abruptly closed restaurant is willing to honor what’s in your hand, you’ve snoozed — and lost. The other reason I’m suggesting you act now is because last week, I went through my personal stash and found some sorry news: my $50 Flying Fish Groupon, a major value at $25 (or so I thought when I bought it), expired September 20. Waaaaah! This is nothing. You should see my coupon collection. That $100 for a meal at Emmer & Rye went to Japan relief nearly six months ago, courtesy of me (who bought it) and chef Seth Caswell (who generously donated it). 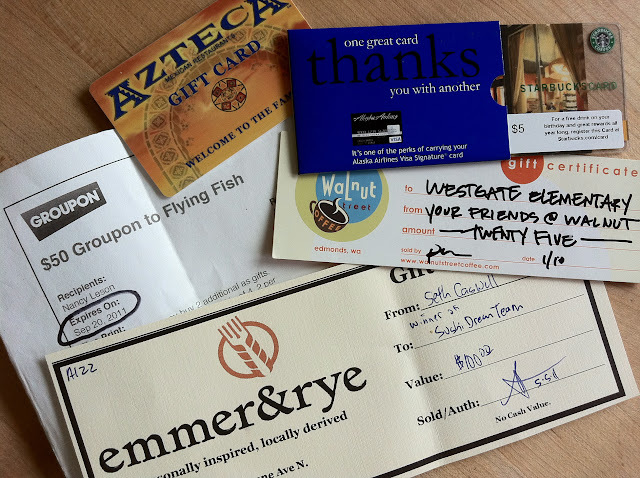 The silent-auction money I shelled out for the Walnut Street Coffee certificate? That helped buy the new playground equipment at my son’s public elementary school. (Did I mention he’s now in his second year at middle school?). I’m still looking forward to using both certificates. Soon. Really. I mean it. Anyway, consider this blog-post a friendly reminder: use, re-gift or donate your as-yet-unused cards. Or, if you’re so inclined, you can swap or sell them. P.S. As a big fan of the Chinook Book, whose discount or cash-off coupons save me a bundle every year (which is why I buy several) I’m here to remind you that the expiration date on the 2011 book is October 31. Use it or lose it! [Update 10/17/11 4:30 p.m.] Just to be clear, Groupon’s “small print” includes information that states: “applicable law may require the merchant to allow you to redeem your voucher beyond its expiration date for goods/service equal to the amount you paid for it.” Which is to say that while I’m out the $50 value of my Flying Fish voucher, I’m still in for the $25 purchase price. Bottom line: if you’ve got a Groupon or its “such-a-deal!” equivalent in hand, use it before its expiration date!